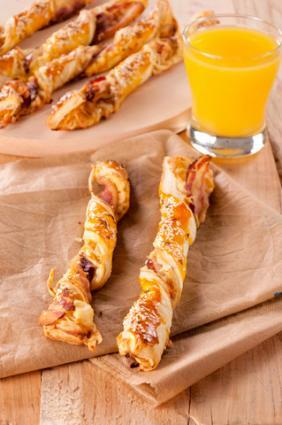 These sweet and savory bacon pastry twists are bound to become a family favorite once you give them a try. They do take a bit of effort to make, but they are totally worth it! This recipe yields 10 bacon pastry twists, but you can double the recipe to make 20 twists if you want to serve a larger group or want to provide more twists for each person you're serving. Line a shallow baking sheet with foil, set a wire rack on top, and spray the race with non-stick spray. Place a sheet of parchment paper over a cutting board, and unfold one sheet of puff pastry onto it with the longest side facing you. Brush the entire pastry with the egg. Lightly drizzle the maple syrup over the entire pastry sheet. Complete coverage is not desired, and using too much syrup will make the pastry difficult to work with. Sprinkle the Colby cheese over just the lower half of the pastry sheet. Using the parchment paper underneath to help lift the top half of the pastry, fold it over the bottom half of the pastry sheet, and press the entire surface lightly with your fingertips again to help the top and bottom halves stick together. Using a pizza cutter, cut the pastry into 10 equal strips. 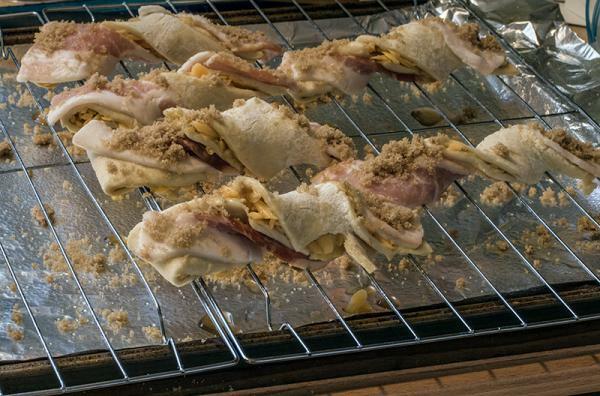 Lay half a slice of bacon on top of the first strip, and gently twist the strip twice. Repeat the process with the rest of the strips. In a shallow dish, stir the brown sugar, cinnamon, and sesame seeds together. Carefully roll one twist in the brown sugar mix to give it a very light coating, and then place it on the wire rack. Repeat with each remaining twist. Bake the twists for approximately 45 minutes, until the bacon is cooked and the pastry turns golden brown. Let the twists cool for about five minutes before carefully removing them from the rack to a serving dish. Serve them immediately. These twists can actually serve as a complete breakfast on their own, and they go great with a nice glass of freshly squeezed orange juice or a warm cup of coffee. If you're planning a larger meal, try serving them warm with your choice of breakfast or brunch dishes such as raspberry-stuffed French toast, scrambled eggs, broccoli quiche, and other favorites.